Name: Signature Luncheon - What’s Lurking On The Dark Web? Dr. Donald Hunt is a post-doctoral research fellow at Georgia State University’s Andrew Young School of Policy Studies in the Criminal Justice and Criminology Department. A former global head of fraud and cybercrime analytics for one of the largest digital payments processors in the world, he currently directs his research toward understanding, preventing and offering human-based solutions and policies for complex computer-based crimes; focusing particularly on phishing, social engineering, and ransomware attacks. 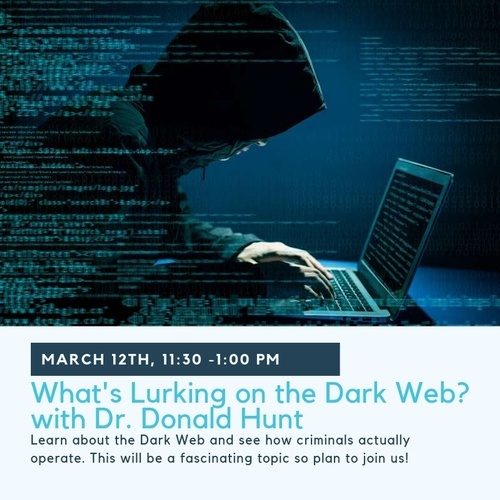 Dr. Hunt is an integral part of the newly formed Evidence-Based Cybersecurity initiative at GSU and is considered an expert in the statistical analysis of human behavior. Don has had articles published in top journals and, during his during his time as a doctoral student, he was even awarded the prestigious Bureau of Justice Statistics Graduate Fellowship in 2015, which came with a $95,000 grant for his research in crime and digital payments. In addition to his work in the US, he regularly performs research with colleagues in the UK, the Netherlands, Israel, and Italy. His expertise has drawn the attention of the news media having appeared as a guest on NPR’s Closer Look with Rose Scott and provided expert commentary on Atlanta news outlets such as the Atlanta Journal-Constitution and Channel 2 WBSTV.